In terms of how women present themselves, they need ”to be three times as good and ten times as confident” as men (quote from film director Hope Dickson Leach). Fail to do this and you won’t be perceived to be as likable as a man presenting the same idea and your message won’t get heard. 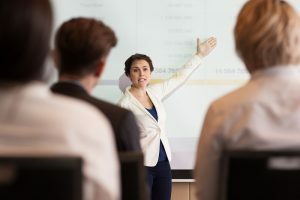 Research from Stanford University confirms audiences react more critically to women speakers even when women and men deliver exactly the same speech. One factor in determining a woman speaker’s success, unfair or not, is her likability. 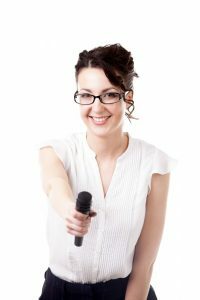 As someone who coaches people to become dynamic presenters, I’ve personally seen brilliant, capable, and/or passionate women fail at the podium because the audience didn’t feel she related to their issues or needs and it directly related to her likability. Be fully present. Convey that you want to be exactly where you are: at the conference, at the fundraiser, at the school, touring the factory. Get to the event early and take the pulse of the group. This will help assuage any anxiety you might have. Suss out the room. Shake hands and make brief conversations. Making contact with listeners conveys a critical meta-message: I’m glad I’m here and I’m glad you’re here. Know your audience. Listen to the local news in a particular community or city to convey that you understand and resonate to the larger social, economic, or political context. Parents care about safety, workers want jobs, scientists want to be believed. Sometimes the speaker has to do her homework and not make assumptions; e.g., coal miners may not want to hear about the virtues of solar power but given concerns about insurance, they might appreciate hearing more about how Obamacare’s healthcare plan could help patients in coal towns. If you are pitching a new idea to a business group, acknowledge their prior milestones and successes. Connect with your message. Be transparent. You have values you cherish and you need to communicate clearly your point of view about the way the world works. At the same time, you need to show respect for the values of your audience (but don’t agree just to be agreeable). People need to understand why you arrived at certain conclusions and respect your position. To avoid the stereotype of women being scattered, you must know your subject matter thoroughly and use key points to strengthens your argument. However, keep in mind that people rarely change their position because they were presented with hard data. Effective persuasion also requires you to be authentic, emotionally present, and sincere rather than just relying on dry facts alone. Be fair. Every hot issue today is complicated and feelings run deep in a polarized world. But a well-informed woman can provoke new ways of thinking, even about a divisive issue such as Roe V. Wade. It isn’t likely for a born-again Christian to be pro-choice, but why make assumptions about all Christians? The listeners may not believe you, but they might believe Dr. Willie Parker. He wrote about his journey in The Christian Doctor Fighting for a Woman’s Right to Choose. Shake people up with new information that shows you are a credible source and not on a rant. You could challenge the assumptions people make about the gender gap by asking, “Would you believe that the largest gender gap between men and women in a GALLUP POLL was in the issue of animal rights?” When you choose to quote experts listeners respect, it’s more likely they will leave your presentation respecting you for being fair. Use humor when appropriate. 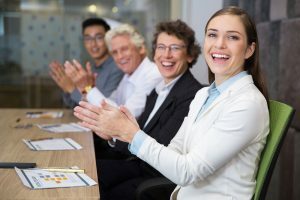 Take the pursuit of humor seriously because it’s a wonderful tool to illustrate your message while connecting with others. Humor relaxes people and conveys a sense of ease. Show your vulnerability, including the ability to laugh at yourself. We don’t have to look far to find amusing anecdotes or common references in the demands of everyday life: How can I remember all my passwords? Who looks forward to April 15th? Find the foibles you and your audience have in common. And never show mockery or derision of any group. In sum, you’ll know your Likability Quotient is high when people are engaged — they’re smiling, nodding, and relaxed. If the audience likes you, they’re more likely to hear your message and respond in a positive way. Increasing your likability increases your ability to persuade. In a future post, I will address how Hillary Clinton’s campaign failed to consider the importance of relating to audiences, how her team failed to coach her on how to connect with people, and how the likability issue contributed to her defeat in spite of her proven leadership experience. « Rising to the Occasion: Stressed but Ready to Speak Up!